FULLERTON, CA--(Marketwired - September 21, 2016) - Samsung SMART LED Signage is delivering captivating viewing experiences to audiences in retail, hospitality, restaurant and numerous other verticals. The fine pixel pitch LED signage features durable construction, optimized power consumption, and most importantly, picture quality that leaves a lasting impression thanks to high resolution, bright screens. 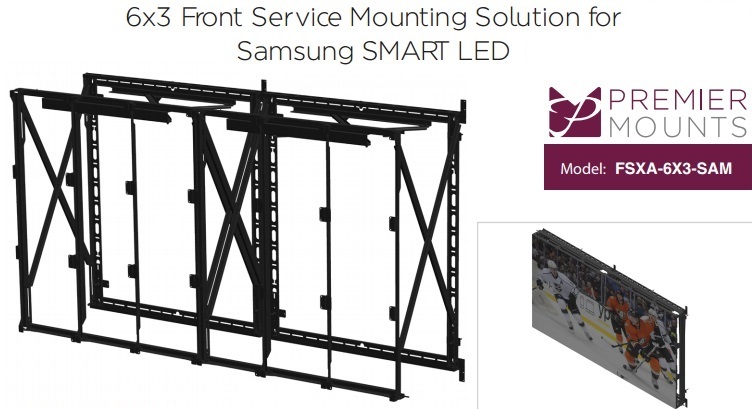 With a 40-year track record developing innovative solutions for their OEM partners and customers, Premier Mounts has expanded their in-house engineering, testing, and manufacturing departments to develop innovative LED Mounting Solutions for Samsung SMART LED displays with the FSXA-6X3-SAM Model Mounts. Featuring an innovative scissor design, the 6x3 front-service FSXA-6X3-SAM mounting solution supports (18) Samsung SMART LED cabinets and provides 25" of smooth forward extension. The open frame design allows complete rear cabinet access with no obstructions and can be automated with the optional actuator kit for systems that require motorized extension options. Each 6x3 integrated frame provides precise installation of (9) LED tiles and allows for additional mounts to be installed horizontally or vertically to increase the overall size of the display. Adjustable wall foot pads allow for fine tune adjustment on uneven surfaces while dual locking latches keep the mount securely in place when service is not required. For custom SMART LED video walls, Premier Mounts provides solutions to meet the needs of any size project. Growth in the adoption of digital displays within retail, hospitality, restaurant, and other verticals continues to move forward with increasing momentum. According to reports, the global video wall market surged over $3.4 billion with expected double digit growth through 2020. Current trends suggest that future growth will be driven primarily by Fine Pixel Pitch LED technology, which has already made significant gains in the video wall space, and is forecasted to account for 15% of total video wall volume and 31% of value by 2019. In fact, 2015 reports show $678 Million FPP LED sales which represents 3 times the value in 2014. For over 70 years, Samsung has been dedicated to making a better world through diverse businesses that today span advanced technology, semiconductors, skyscraper and plant construction, petrochemicals, fashion, medicine, finance, hotels, and more. Samsung's flagship company, Samsung Electronics, leads the global market in high-tech electronics manufacturing and digital media. For 40 years, Premier Mounts has consistently built a reputation for quality and innovation in the audio visual industry. Premier Mounts continues to work closely with major display manufacturers and customers all over the world and in every market to innovate and support new products like FPP LED technology with mounting solutions. Premier Mounts continues to be the industry leader and innovator for projector mounts, flat-panel display mounts, and carts and stands. The company has a long history of creating OEM and custom products for partners, integrators, and resellers in the AV Industry.